Three sided heating - left and right walls and floor - for hobby and school use. 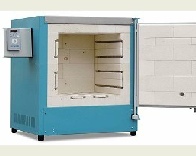 4 Tabletop kilns - table and castor option available. Includes 10 program Staffordshire/Rohde controller. This price includes delivery by tail lift vehicle to the road side in mainland UK. 35 litres / 1.23 cuft approx. Ask us about this months CTM options such as Interest Free and Subsidised Finance. Please talk to us about your needs and ampage available and we will try to ensure you get the best possible kiln for your budget. 65 litres / 2.21 cuft approx. 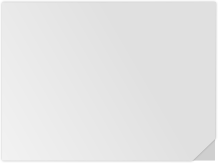 Deposit min 10%, max 50%. We usually have a Ecotop 43L on display for people to see the quality. Lead time is usually 4 to 5 weeks with delivery by tail lift vehicle direct from the factory; but for the smaller top loaders it can be less than 2 weeks. Top Loaders usefully come apart and go through 99% of doorways, and as they are an efficient use of space can be a lot cheaper than a front loader. Front Loaders are in one piece or have a separate leg frame that the kiln has to be lifted on to, and they are very heavy, so careful thought must be given to doorways, steps, slopes etc - we can only offer help putting it in place if you are close to one of our branches. You may need to consider using industrial movers for the largest front loaders. We are happy to give advice about kiln size, ampage (single / three phase), start up routine etc. These Rohde pages give the official Rohdeâ€™s UK List Prices. 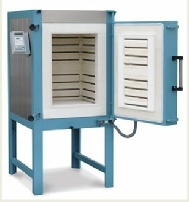 For each kiln we list the official UK List Price including delivery from Rohdeâ€™s factory and the kiln furniture set price, then the Total List Price (incl kiln furniture set) before VAT and the Total List Price including VAT. Rohde Price Guarantee - We will beat any genuine written like for like kiln price ! 6, 12, 18, 24, 36, 48 months payment, 10% to 50% deposit. Subject to credit approval of Close Brothers Retail Finance. 105 litres / 3.70 cuft approx. 130 litres / 4.60 cuft approx. 172 litres / 6.07 cuft approx. 207 litres / 7.30 cuft approx. 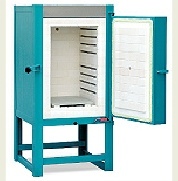 If you are looking at a 200 to 250 litre kiln it is worth considering the ELS150 or 210 sized kilns. 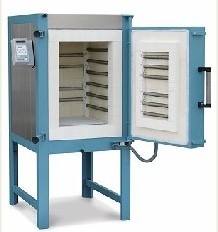 The ELS series of kilns use a sliding drawer system enabling you to pack in 20% more ware into the kiln. They are more expensive but worth considering. Five sided heating - walls, door and floor - for workshop and school use. Leg frame comes separate to enable access through doorways but kiln needs lifting. 100 litres / 3.53 cuft approx. 150 litres / 5.30 cuft approx. 200 litres / 7.06 cuft approx. 250 litres / 8.82 cuft approx. This price DOES NOT include delivery by tail lift vehicle to the road side in mainland UK. 330 litres / 11.65 cuft approx. Extra shelves - please ask (with kiln). You need 2 per layer. 480 litres / 16.95 cuft approx. Most of the Rohde kilns are available as Three Phase kilns at no extra cost -some are only available for using with Three Phase power. Powerfull five sided heating - walls, door and floor - for a hard working workshop and school use. 600 litres / 21.2 cuft approx. Extra shelves - Please ask (with kiln). You need 4 per layer. 750 litres / 26.5 cuft approx. Ask us about this months CTM options such as Interest Free / Subsidised Finance. We will match or beat any written like for like Rohde kiln price.